Interview questions are always tough to design. On the one hand, you need to create something that will not be trivial to do, and on the other hand, you have a pretty much hard time limit to a reasonable solution. For example, while implementing a linked list is something that I would expect anyone to be able to do in an interview, implementing a binary tree (including the balancing), is probably not going to be feasible. Interview tasks (that candidate can do at home) are somewhat easier, because you don’t have the same time constraints, but at the same time, if you ask for something that takes a week to write, candidates will skip the question and the position entirely. Another issue here is that if you ask a candidate to send a binary tree as a interview task, they are going to google –> copy & paste –> send, and you learn absolutely nothing*. * Oh, sometimes you learn quite a lot, if a candidate cannot do that, they are pretty much disqualified themselves, but we could do that more easily with Fizz Buzz, after all. So I came up with the following question, we have the following file (the full data set is 276 MB), that contains the entry / exit log to a parking lot. The first value is the entry time, the second is the exit time and the third is the car id. Details about this file: This is UTF8 text file with space separated values using Windows line ending. You can find the full file here. The only additional stuff is that we measure just how much this cost us. And this code process the 276MB file in 30 seconds, using a peak working set of 850 MB and allocating a total of 7.6 GB of memory. I’m pretty sure that we can do better. And that is the task we give to candidates. This has the nice advantage that this is a pretty small and compact problem, but to improve upon it you actually need to understand what is going on under the covers. I’ll discuss possible optimizations for this next week. Ryan, What do you mean by the last one about dictionary and files? Using lambdas for properties should have no performance impact, since the IL compiles to the same as if the property was declared without a lambda. Read a line at a time and keep a Dictionary<int, int> /<car id, time in ms>/ and update dictionary accordingly, fast and easy! Hmm, the markdown didn't work? Obviously the way to go is to use a dictionary, but if there are a lot of unique ids, you could write intermediate sums to a few files, merge the files until you have one file. How much time is given to candidate to do it on interview ? it really depends what are your limits, if you want to do small memory usage, you would have to read the file twice. if you want performance assuming you don't have memory limit for the dictionary - just hold them by dictionary id and add the sums. First thing I would try and measure is change to File.ReadLines. Second to change all Record props to get; private set; and set the props in the Record ctor. Where can I find the 276MB file? Initially, when I read that comment, it seemed that lambda syntax was being singled out as an issue. I appreciate now that you meant the usage of the properties, potentially in multiple calls, could be a perf problem that needs looking into. I'm not sure which order .NET uses to parse dates with DateTime.Parse, but as the date format seems to be fixed, it should be faster to use DateTime.ParseExact instead of having .NET guess the correct format. Since the content size is fixed, use a stream reader and read only the text needed instead of relying on ReadAllLines or ReadLines. That will remove a lot of string allocations from read lines and splits. Before even running a profiler, I'd fix the obvious algorithmic inefficiency and process line-by-line with running totals. Next step might be to eliminate any repeated work, eg. Split calls, assuming any remained after the first step. Then I'd apply the profiler. My gut says the DateTime.Parse calls are likely to cost more CPU time than string allocations. While we are doing a lot of allocations, I would by now expect I/O to be dominating in the profiler. Regarding the use of a fixed-size buffer: the file is specified to be UTF-8, not necessarily ASCII. It's probably reasonable to assume that it contains no non-ASCII characters, but I'd still want clarification on that point before assuming I could handle it as such! Is it possible to get the 276 MB file in question? So I had some spare time tonight and since I've been optimizing code all week I thought I give it a try. Code from blog: "Took: 38.051 ms and allocated 9.661.701 kb with peak working set of 1.167.448 kb"
Code from the 7-Zip File: "Took: 33.425 ms and allocated 4.587.464 kb with peak working set of 1.260.084 kb"
Here are the numbers: "Took: 1.300 ms and allocated 65.706 kb with peak working set of 33.080 kb"
So compared to the blog version it runs about 29,5 times faster, allocates 0.7% of the memory and has 3% of the peak working set. 1. We know it's (probably) a machine-generated file, records length is fixed, 50 bytes per line including newline characters. 2. The file is UTF-8 (no BOM), but it's just using ASCII characters, so we can treat is as binary, one char = one byte. 3. Opening the File with FileOptions.SequentialScan and larger buffer size might make things a little faster. 4. The date format is fixed, it easy to parse it ourselves. No need for DateTime.Parse. Some goes for Id. 5. Id is 8 digits, so we don't need a long. Int is sufficient. 6. There is no need for Record to be a class type, we can make it a struct. 7. 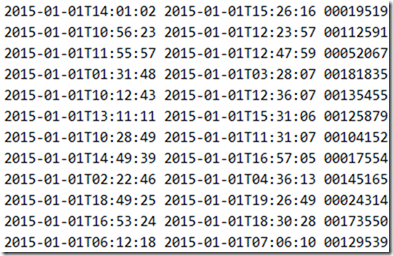 We don't need to store Start and End timestamps since we are interested in the duration anyway. But since we need to do a little Math, we store ticks. 8. Linq grouping isn't really fast, much better to store our records in a dictionary and do the grouping operation (i.e. the addition) ourselves. 9. Our output file is UTF-8, but we just use ASCII characters. So we can write ASCII characters as bytes. 10. We know each output line is max. 23 bytes, so allocate once and reuse. 11. Don't try this at home. mktime() is surprisingly slow. Based on Michael's results .NET's DateTime is actually much better - if I remove the same-day optimization my code takes 2.8 sec. Record validation is compiled out since it's in an assertion; compiling it in reduces the time to 320 ms. Validation code could be optimized as well. P.S. mmap is actually pretty useless here - it saves about 20 ms based on my measurements. Not really worth it but I left it there because why not. However, note that your code has a major difference in behavior. You are assuming that the number of ids is small. And in fact, the higher id value in the sample file is 203,220. That means that your array is under 1 MB in size, and you save all the dictionary lookups. However, if you consider the size of the id, it has 8 chars, so it can be a max of 99,999,999, in which case you'll be using 400 MB of RAM or so. Doable, but quite expensive. This thread became very interesting! , I'm sure there are even more optimization such as write c++ external dll and include asm functions so all parsing and dictionary costs can be even more efficient and with less cpu instructions. Well the first question should be what the performance goals are, in terms of wall time, memory usage and cpu load. But given the question we could assume that we want the best possible performance in all these aspects balanced with priority to wall time first, memory usage second and cpu load last. We have fixed size, fixed format records as input: two timestamps with seconds resolution and an 8 digit id with the alphabet '0'..'9'. the 8 digit id; could be represented by a uint (it requires a maximum of 7 nibbles, 27 bits to be exact, to represent 0-99999999). a duration with a seconds resolution; could be represented by a uint (assuming more than 3200 years duration is no longer realistic). use a memmap over the input file, parse byte records with some level of format validity checking. 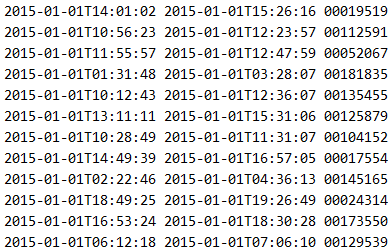 custom timestamp parsing to a seconds number, duration the difference between them. if we don't mind allocating around 380 MB, we could also simply use an array indexed by the Id (this would not be memory or cache friendly but give us an interesting baseline measurement). the quick easy solution would be to track them in a Dictionary<uint, uint>. we could also note that the information content of an id is max 27 bits and use a (custom) cache conscious compressed trie. parallellize work if we find that a significant portion of it is CPU bound. It is an interesting enough question. I may give this a go. Re: timespan output format - fair point. I was pretty surprised that the output portion does not seem to take any meaningful time in my case - I'm used to printf being slow. As I said I don't have a working profiler which limits my ability to analyze this code :( anyway, I think this is fixable without changing the resulting time that much because printf basically has to do roughly the same operations when formatting the number that you'd need to do here, it just does it in decimal as opposed to base 60. I'll update the code to match the output format and we'll see what the impact is. Ah, wait, I am not counting the time it takes to output :( with printf it's actually 230 ms. Damn it. Updated gist (https://gist.github.com/zeux/999654a6ce2a32e219a2ed0f1f0fa935) with new output code and new validation code - 175 ms now with both output and validation enabled (validation doesn't check that your time format is precisely right, but it does check all separators and digits for sanity). Ok, picking off where I left, I optimized my solution a bit further. We are under a second now: Took: 896 ms and allocated 60.807 kb with peak working set of 29.616 kB Not bad. But let's not stop yet. 16. Use DateTime just when the dates have different year (just about 900 cases). Now the allocated memory is down to 21.914 kB. It's time for the gloves to come off. Dictionary<,> has to go. I'm now 86x faster than the original solution, allocating just 0,02% of memory and have a peak working set that just 1% of the original. And still i'm using no unsafe code. I know I could loose the LinkedList<> for the given data set, but right now the solution is correct, fast and memory efficient for any well-formed Input file, even if it is 10x the size, so removing it would be kind of cheating. This was a quite interesting assignment. I did not reach the optimization levels some of the others in this post but I got down to 3 993 kb with peak working set of 13 320 kb. For anyone interested my code is at gist. Some people seem to roll their own date calculations but that feels quite risky to me. There are so many things to consider such as leap years, daylight savings time (depending on country), leap seconds and even events such as Russia getting rid of daylight savings time. Michael, nice! This actually matches my past experience pretty well - my rule of thumb from the days of working with .NET was that tuned .NET code is roughly 3x slower than tuned C++ code for compute-bound problems, assuming .NET code does not use unsafe. I was thinking of a two-level array structure, guess I'll go ahead and do that as well. https://gist.github.com/zeux/90a49b85c8cfdf04ffa5489ec8916271 - 135 ms. Two-level array on its own makes no difference for the time, but allows a nicer structure for multi-threading; this is using 4 threads on a 2-core HT system (same time as 2 threads, really). @Arseny: That's a really great solution! I might try your multi-threading approach if I find the time. I tried multi-threading before, but your approach is much better. I guess I was thinking to complicated. There is one more thing I'd like to share. I tried using unsafe code to do a poor man's variant of SIMD. I pinned the memory for my read buffer and then obtained a ulong* pointer to do some calculations. First I convert the ASCII digits to numbers (-'0'), then I convert the Id to an Int32. Please note that the constants for substractions and the Int32 conversion AND masks are adjusted for the little-endianness of Intel CPUs. This operation makes the code run a little faster, but it's allocates more memory (because of pinned memory?) and peak working set is higher. How can I obtain a copy of that 267Mb data file? So the Reference version is 155 times slower, allocates 2450 times more memory and has a 4.29 times higher peak working set. Using the "FlexArray" (basically a single level trie, or "jagged array" using the first 12 bits for its first level) performs significantly better than a regular pre-allocated fixed size array uintor a Dictionary<uint,uint>. I would expect that a proper cache conscious trie implementation would improve this even more, because (I think) we are seeing primarily processor cache effects making "FlexArray" faster. I also expect performance improvements from @Michael's "bit hacking magic" above. It is similar to the approach I used in an earlier "Ayende Challenge" w.r.t. Etag parsing (see https://ayende.com/blog/169796/excerpts-from-the-ravendb-performance-team-report-etags-and-evil-code-part-i). @alex: Great solution! I ran it on my computer and it was a little bit faster with about 225ms. But I took a page out of your book and improved my solution and ended up with 157ms. If you want to know how, check the next blog entry (The obvious costs). on a consumer grade SSD, only read this file from disk will take about 0.5 sec (550 MB/sec / 276MB). so you need to have a RAM disk to make it faster. you should be able to parallelize it if you have a read block of 64K (or so) and process it in one thread (record size is 50 bytes) . So you have one thread which is reading and storing what read into kind of a queue ( disruptor pattern, non blocking ) and others reading 64K blocks from that queue and processing it in own thread data storage - again non blocking. Once threads are done, you combine results from each thread into final result. this assumes you can read as fast as you can process data. @Ayende: I knew that. The point was that IO may impact tests/processing and depending how it impacts you will need to change strategy for parsing. The other point that it should be possible to have parallel algorithm which is faster than single threaded if you can avoid blocking/sharing data between threads, since others were getting opposite results. With the cache or RAM disk you can probably open file for read in each thread, and seek to position (increment position by read block size 64K or more, seek, read, process, in each thread) which can the only thing shared across threads. Obviously you don't need more threads than you have CPUs. The cost of performing a reasonable amount of validation of the input (input values that are in range of their respective domains and formats that match expectation), for the solution I posted above is around 50 ms, i.e. around 20% of total run time. I would still consider that well worth it. Do you allow candidates to browse the internet when working on this question? I took this log file as an exercise in my ongoing learning of F#. The language doesn't matter, but I was shocked by this huge perf gain just due to the overall algorithm. The problem was to return the time span for a given id/date. Here's how the exercise progressed: * Create tuples out of the lines (granted, wouldn't scale to larger file). Pick the correct line by checking for id first, then date. 25 seconds. * Same as first try except simply using a different method on the F# sequence type (the first method apparently didn't short-circuit after matching). 12 seconds. * Same as above method, but parallelize the file into chunks. Was quite surprised to see so little gain; would've thought that the thread overhead would be minimal compared to gains. Worked best at 6-15 chunks: 6 seconds. * Gather lines as simple string arrays splitting on space. Only return those line/arrays that contain the matching id. Reduce to matching date. This ran subsecond, nearly instantaneous. I was incredulous and had to debug to ensure that it really was searching the entire file. FizzBuzz can get pretty interesting sometimes!